Incredible Edible believes in the benefits of connecting communities; the connections between people as well as the connections between groups and organisations. This Incredible story from Incredible Edible Ulverston & Ulverston in Bloom demonstrates the impact that working together can have on individuals and communities. 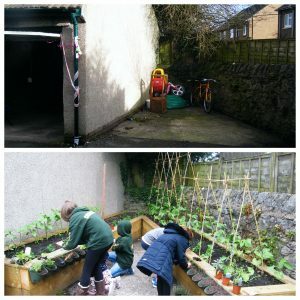 Last year a member of staff from South Lakes Housing asked Incredible Edible Ulverston & Ulverston in Bloom to support their application to senior management for financing a group of families (mostly single mums) to develop a garden to grow fruit and veg. It was the obvious skills, knowledge, experience and enthusiasm from the Incredible Edible group which helped get the initial money to invest in this Incredible opportunity. 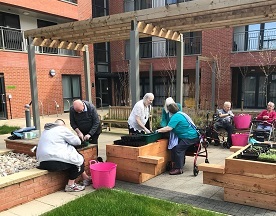 Kim from the group provided the support and went to meet the residents and take some ‘before’ photos, which are always crucial to show everyone involved the progress made – and are great when you need to report back to funders too. The flats had previously had a bad reputation so the families were keen to turn it around, and the act of growing together in the shared space was the start of taking that new direction. 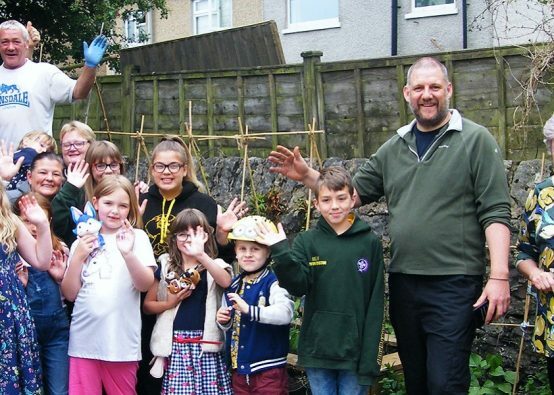 The Housing Association provided raised beds, compost and wall mounted growing pots and Incredible Edible Ulverston & Ulverston in Bloom worked with the families to plant everything up. 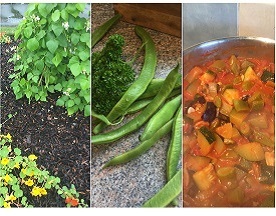 The families worked hard and involved small children in watering plants and teenagers in planting and labelling what was edible and held several social events, ensuring connections ran wide and deep. Having those community networks also helped out with resources as friends with allotments and Incredible Edible Ulverston & Ulverston in Bloom provided lots of plants. 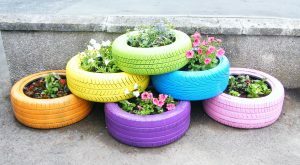 One of the mums also developed an additional garden by recycling pots and tyres and was extremely creative. The project was a big success and was commended by the regional and national In Bloom judges and won the Mayor’s Award in a local competition and the Greening Grey Britain Award (the Cavendish Trophy presented by Lord Cavendish) in the Cumbria in Bloom awards Ceremony (which was held in Ulverston). Remember that you shouldn’t grow anything you’re going to eat in a tyre because they leach chemicals into the soil, but they’re great for pollinators and companion planting. The residents were beyond excited and the young woman who created the recycling garden also completed her painting and decorating qualification and got a job with BAE Systems painting submarines! Which just goes to show you can never tell where your Incredible experience will take you. As good news travels fast, Kim has had a visitor from a social housing estate in Manchester to learn about what had gone on in Ulverston. The visitor was so impressed by the recycled garden, taking lots of photos, which have since inspired a similar project on her estate. This story shows how working together is a great way to get Incredible activities happening across your communities. And even though sometimes it can be hard to collaborate, rather than do things your own way, the benefits of connected communities are huge. If you’d like to connect with your local Incredible Edible group, have a look at our map to find a group near you.